A very nice and bright apartment situated in the area of Congreso close to to the Parliament building and one block away from Corrientes Av. It is close to many excellent restaurants, bars and many cultural activities such and theatres and tango and milonga schools. 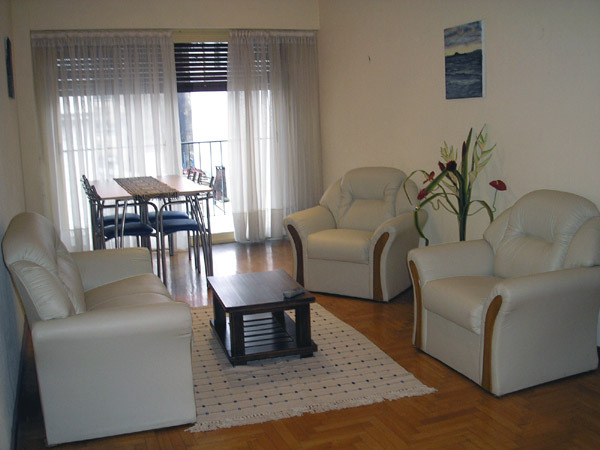 The apartment offers an ample living room with comfortable sofas , aircon , TV with cable . Internet . Wi Fi . Also there is a dinning area with table and chairs. The living has windows with an exit to a balcony . It has two bedrooms, the main one with a double bed and aircon and the second bedroom has twin beds. Bathroom with shower and kitchen equipped with breakfast area. Balcony to the street , hardwood floor , TV , cable TV, landline telephone,Internet fast connection, Wi Fi , two aircon cool/heat . Kitchen with refrigerator , microwave , gas cooker , oven , dishes , kitchen utensils , towels , linens . Cleaning service once per week . Good building . Doorman 24hs . City center, metro station, bus stop, parliament of Buenos Aires, church, college, gym, solarium, restaurants, bars, nightlife area, shopping area, square, cinema, cultural centre, historical place, laundry, parking space, tango school. Included: Electricity , gas , water , building fees , Telephone for local calls , city taxes , cable TV , high speed Internet, maid service once a week.